A terrible earthquake struck Haiti in January, 2010, and by May, Lisa Rueff of Sausalito traveled to this suffering country to provide aid for earthquake victims. She fell in love with the Haitian people and their strength and courage, and felt compelled to visit again. 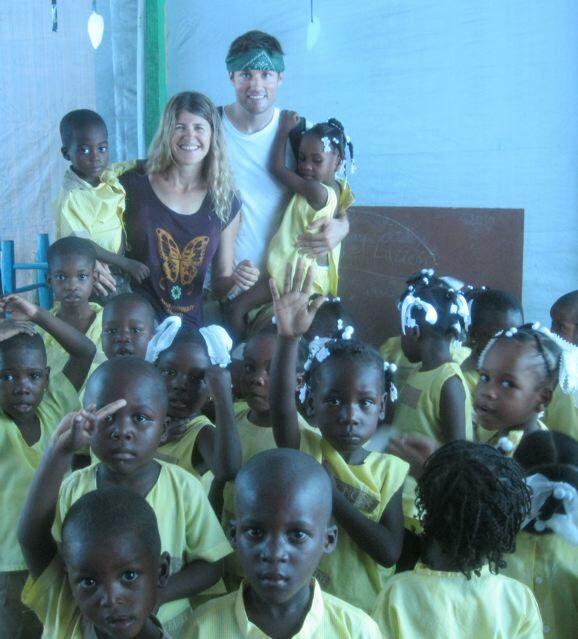 This October, Lisa organized a Yoga and Volunteer Retreat to Haiti. She and 14 Marinites traveled to Haiti where they had a rewarding experience helping orphans and others who were displaced by the earthquake. I was headed off to Haiti. In May, I had traveled there to work with the Global volunteer Network in tented cities and orphanages, and in October I decided to go back. I organized a Yoga & Volunteer Retreat to Haiti, which offered my yoga students an opportunity to return with me and experience first-hand the strength, resilience, gratitude, faith and love inherent in the Haitians. I, along with 14 Marin County residents, ventured to Jacmel, a beautiful, tropical seaside town 45 miles south of Port-Au-Prince, once famous for its historic building and artisans, yet heavily hit by the earthquake. We volunteered with two different orphanages. The Faith and Love Orphanage, run by Marlaine and Daniel Alix, houses 84 children. This orphanage is meticulously run, and all of the kids take care of each other. The older children take care of the younger ones, and the children play beautifully together. Before leaving for Haiti, I spoke with Marlaine at the orphanage, who let me know she was building a dental clinic on her property to make up for the absence of dental care in their area. My group sent ahead money for supplies to break ground. When we arrived, Marlaine proudly showed us the supplies we helped to purchase. We could not wait to get to work! Half the members of my team grabbed shovels, and immediately pitched in. Another part of my group chose to paint the orphanage. The walls of the orphanage were filthy, and in need of quite a few layers of paint. Our money also went to buying paint, brushes and rollers for the orphanage interior. A few members of my team opted to simply play with the youngest orphans who could not yet attend school. Together they enjoyed arts and crafts activities that we brought over from the states. From anywhere we worked on the orphanage grounds, you could hear the kids having so much fun playing with our team members. Volunteering at Faith and Love was the perfect place to spend the morning. Every hour, the teams rotated duties. Each person spent ample time playing with the kids, painting, or doing construction work with the dental clinic. We were all elated at the progress we had already made with the different projects. We also worked with Jacques Africot, who runs an orphanage for 11 children, called Better Future International, whose mission is to create a better future for orphaned and abandoned children with nutritious food, healthcare, education and supportive services in a family environment. They operate a successful orphan home, dedicated to improving the lives of orphaned children by providing the security of a family structure, the opportunity that comes with proper education, and the physical benefits of proper nutrition and medical care. They intend to give each orphan support until graduation with a baccalaureate degree. They do not place children for adoption, but rather seek to help them live successfully in their native country and culture. We were invited to take part in the after-school program the founder, Jacques, had recently implemented at a local community center. The kids all seemed very happy at their home. Their model of “Raising Global Citizens” seeks to make a difference in both the short-term needs of children and the long-term improvement of disadvantaged communities by raising children as responsible citizens. He brings the 11 kids from the orphanage together with about 15 more local kids Monday through Friday, from 3pm-5pm. The kids get together for after school tutoring, computer classes, English classes, fun games and activities from 3pm-4pm, and from 4pm-5pm they enjoy a delicious and healthy meal together. During the afternoons we also worked with Bonite Affriany, a 72-year-old Haitian woman who is the equivalent of a Haitian Mother Theresa. She is so full of love, strength, energy and helps everyone in her community. She currently feeds over 275 children everyday, at one time, with a nutritious and filling meal. She provides for these 275 children in her community to attend schools, and conducts an adult education program to teach mathematics and reading/writing in Creole and French. The program currently has 11 qualified teachers and three classes with 42 adult students. She began a micro-loan program that lends adults money to purchase groceries and to resell them, enabling them to provide for themselves. She provides clothing for the children and adults in her community, as well as in the neighboring tented cities. On the compound, she has built a church that is divinely spiritual, and offers bible study as well as voice lessons to the children. Bonite works tirelessly to help meet the needs of the people of Jacmel. Every moment of the day was a highlight! Our time spent in Haiti was so memorable, uplifting and meaningful. When we first arrived, we were invited to attend the church service at the Faith and Love Orphanage. The kids were so welcoming, and they greeted us with the biggest smiles. Led entirely by the kids, the orphanage church service was filled with the most beautiful sounds. Three of the older girls, in their teens, conducted most of the service with confidence, poise, grace and beauty. It sounded like angels descending from heaven, their voices harmonizing together so sweetly. Towards the end of the service four young girls, aged about eight to ten years old, shyly got up and sang with the most precious and sweet voices. It was so soulful and spiritual. All of the children in the orphanage sang from their plastic seats, clapped, swayed and got into the music. They loved it. During the service, the founder of the orphanage, Marlaine, spoke for just a few minutes. She personally introduced me to the kids and explained to them I had been to the orphanage before and was so touched by the children that I brought a team back with me. With Marlaine’s encouragement, I then introduced my team to the children. Immediately after the service ended the children hugged, kissed and embraced all of the volunteers, and thanked us for being there. The 84 kids were each so full of love and appreciation, and they made us feel so welcome and delighted to be there. We toured their facility, each child holding our hands and leading us around. The kids all sleep in bunk beds, with their belongings neatly organized. They all seem very healthy, nourished, well-adjusted, and happy. Knowing we were going to be spending the majority of our time helping this particular orphanage felt so special. Teaching the kids yoga at the different orphanages was a true highlight. Once I laid down the mats and put them in a circle, the kids were so excited, and we had so much fun! I led them through very playful and interactive yoga sessions. We emulated all the animals, with sounds and movements. The children were crawling around on all fours like cats, hopping around like frogs, swaying like elephants with big long trunks, and slithering around like snakes. We held hands and practiced yoga poses together. Fearless, and full of fun, the kids tried and enjoyed everything! My favorite part of the yoga practice was on the first afternoon, when we sat together in a circle at the end of the practice, with our knees all touching. I invited the kids to close their eyes and make a big wish, and as the director of the orphanage translated, the kids all closed their eyes and with deep concentration and earnest faces, they made their individual wish. We then had the kids write out their wish on a colorful flag, and we hung the flags as a string of prayer flags. The kids were so animated and proud of what they wrote down. Another highlight was feeding the 275 children with Bonite. Spending time with this inspirational woman, who works around the clock and helps so many people, is a sight to behold. Many of the kids she feeds are from the nearby tent city that I had volunteered with in May. When I first entered Bonite’s property, I was surrounded and hugged by kids who remembered my name from five months prior. With smiling eyes and broken English, they kept thanking me for returning. The Haitian people are full of appreciation, faith, joy, strength and resilience. They may not have much, but they value and appreciate everything they have. Initially, I went to Haiti to “help” out the Haitian people. Little did I know that by bearing witness to their hardships, and seeing their profound gratitude and open hearts, they cracked my heart open to loving and caring, allowing me to rediscover what is truly important; helping one another, being of service, and giving more than you can take. The greatest challenge was leaving Haiti, a country I had fallen in love with. The children at the orphanages were so full of love, fun and playfulness. The adults that we worked with, including Bonite Affriany, Jacques Africot, and Marlaine Alix, were so inspiring that one could not help but want to stay and continue the good work. We felt that in the short amount of time we were there, we had accomplished so much. The entire group wanted to stay and continue with the efforts. Unlike many other travel destinations, safety was a concern, primarily after dark. Perhaps erring on the side of caution, I requested that none of our volunteers leave our hotel after sunset. There were no complaints as I had booked accommodations at two very beautiful and comfortable hotels with delicious restaurants directly on the water. Both hotels had lovely, enclosed seaside courtyards, spacious enough to practice yoga together as a group. That being said, we felt very safe during the daytime in Haiti and members in our group ventured out alone during the day and never felt at risk. We flew from San Francisco to Miami and, after a short layover, on to Port-au-Prince. Our total air travel time was about seven hours. Once we arrived in Port-au-Prince and negotiated our way through traffic, we traveled just under three hours through breathtaking countryside, with steep mountainous roads, to get to the seaside town of Jacmel. I would recommend this trip to anybody interested in being of service and making a difference. On my team, I had a young woman in her early 20’s, and a woman over the age of 70. Everyone had exceptional experiences, and expressed the desire to return. I recommend this to anyone who enjoys playing with kids, meeting extraordinary people, and bearing witness to how people can make the most of a challenging situation. Every evening I led a yoga session as an opportunity to relax, rejuvenate and nurture yourself after a day of intense volunteer work. Knowing the healing, calming and transformative powers of yoga, this gift was offered to both my team as well as to the Haitian people. I will be leading yoga and volunteer trips to Haiti and other destinations in the future. For more information about joining upcoming trips, click here. This post is by Chantal Griffin, who visited an orphanage in Cambodia along with her husband Mick during a Southeast Asia adventure. Through a contact at their hotel in Cambodia, they were directed to a local town market to buy school supplies (pencils, markers, crayons, etc.) to give to the kids. They also purchased 100 pounds of rice, 20 pounds of sugar, 20 pounds of salt, ten liters of cooking oil, soy sauce, fish sauce and cleaning supplies. “It was very satisfying to know that 100 percent of our contribution went directly to the kids whom we met,” Chantal says. For the rest of their story, read on. We traveled to both Cambodia and Vietnam to see sights such as the spectacular temples of Angkor, Cambodia. Built in the 12th century and numbering over 100, these stone temples are the single largest religious monument in the world. Their remarkable scale and architectural ingenuity can only be appreciated from a personal viewing. Rather than stay at one of the many large resorts that line the main road, we opted for a boutique hotel called the Golden Banana, in the nearby town of Siem Reap. Cambodia is a country that has overcome many challenges (centuries of war) and is one of the poorest countries in the world. We found the people to be extremely friendly and approachable, however we also encountered much poverty and despair. Like many visitors, we struggled to find a way to handle the difference between our own (relative) wealth, coming from more a privileged society, and the poverty around us. While it is easy and tempting to give money to street kids selling beaded bracelets for a dollar, we learned they were kept out of school to “work” the streets. Therefore, we wanted to give in a way that would offer lasting support rather than encourage young kids to stay out of school. Through our hotel, we found an agency in town that referred us to an orphanage where we were able to see what was needed. With a list in hand, we went to a nearby outdoor market to buy these items. In addition to Cambodia, we spent two weeks in Vietnam where we visited the north, south and central parts of the country, each offering a diversity of scenery, climate, food and activities. We started in southern Vietnam in Ho Chi Minh City (Saigon) where we toured the sites (through chaotic traffic) on motorcycles driven by locals. We also visited the food markets and many Hindu temples. Through our hotel, The Rex Hotel, we took a half-day cooking class which turned out to be a delicious adventure. From Hanoi, in the north, we took a side trip to Halong Bay and spent three days and two nights on a Chinese junk boat cruising around the hundreds of pinnacle-shaped, limestone islands (called karsts). We were able to kayak to secluded beaches, explore grottos and caves with stalactites and stalagmites as well as see the many floating villages that thrive among the karst formations. Also from Hanoi, we took an overnight train to the mountain village of Sapa which is just a few miles south of the Chinese border. Sapa is home to several minority tribes whose distinctive colorful dress identify the various groups including the Black Hmong, the Red Dao and the Flower Hmong. With a local guide, we spent a glorious day hiking from village to village and were able to see how the locals farm, build their huts, cook, make tools, textiles and clothes. Vietnam is also a shopper’s paradise. There are tailors and cobblers on every street corner where custom-made shirts and shoes can be had within 24 hours. Undoubtedly, Hoi An, in Central Vietnam, is the best place to shop. Hoi An’s riverside location is enchanting and it’s bordered on the east by the South China Sea making it a great beach destination too. This ancient town prohibits motorized vehicles so it’s a walker’s delight and bicycles, which are easy to rent, abound. We had been warned not to travel by car because the roads are bad and the traffic can be terrible and we were happy we took that advice. Also, we were warned before going and when we were there that the overnight train to Sapa can be a very unpleasant experience due to the condition of the toilets after several hours on windy mountain track. We opted to take the Victoria Express which can only be booked in conjunction with staying at the Victoria Hotel in Sapa. What could have been a major challenge turned out to be a first class trip. Finding enough time to see and explore all that Vietnam has to offer was the biggest challenge. We felt that we could have stayed another week to visit the southern beaches and the Mekong Delta. Architectural and history buffs would delight in the rich pasts of both countries. Beach lovers, hikers, foodies, shoppers, nightlife-seekers would also find great pleasure in visiting Vietnam. We met travelers of all ages from around the world and with equally diverse budgets. The least expensive room we stayed in was $15 night and the most expensive was $180–so there is truly something for everyone.